Tonight was my first opportunity to watch a College Match Day on ESPN3, with the No. 9 Texas A&M women at No. 5 Florida. The first two CMDs, at Florida State, were during the Women's Team Indoor, and the third of the season, Ball State at Notre Dame, I attended in person. (For my coverage of that match and its doubles-last format, see this article at Tennis Recruiting Network). This was a conference match between two Top 10 teams, so it was expected to be the most competitive match of the four, and it looked as if it might actually come down to the doubles point, which is played only if the six singles matches split. Each team won three first sets, but Florida took early leads in the second set at line 1, with Olivia Janowicz going up 5-0 on Cristina Stancu, and line 6, with Kourtney Keegan up 4-0 on Rutuja Bhosale, while Texas A&M couldn't do the same in the matches where they had lost the first set. Gator senior Alex Cercone closed out Saska Gavriloska at line 3, 6-3, 6-1 and Sofie Oyen followed a few minutes later with a 6-1, 6-3 win over Anna Mamalat at line 4. Meanwhile, Stancu had come back from 5-0 down in the second set to get back on serve, but she was broken at 4-5, giving Janowicz the set. 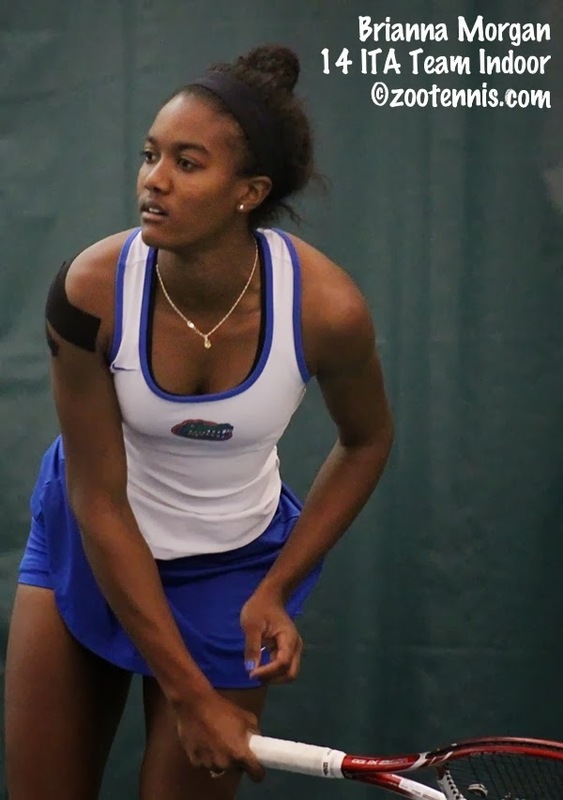 Keegan was rolling at 6, and she gave Florida its third point with a 4-6, 6-1, 6-0 victory over Bhosale. Florida's Brianna Morgan had taken a 5-3 lead in the second set against Ines Deheza at line 2, after taking the first set 7-5, but was broken serving for the match. Deheza couldn't take advantage however, and she was broken to give Morgan the clinching 7-5, 6-4 win, the 126th straight home win for the Gators. After being drummed by Stanford 7-0 in Palo Alto last Sunday, Florida had plenty of motivation, not to mention a home crowd of 456 and an ESPN 3 streaming audience to impress. The Gators, who lost to Texas A&M 4-3 in College Station last year, kept the drama to a minimum this year and did it in under two hours. 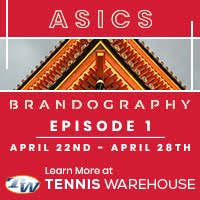 I was surprised by the number of production glitches in the streaming, with a missing previously recorded conversation with Thornqvist at the beginning, and poor audio for the interview with USTA President and Chairman Dave Haggerty. The placement of the camera and its angle on court 1 was also distracting, with too many spectators' heads blocking the view. I realize the challenges of trying to cover six matches at once, in real time, with no prior experience in production to draw on at these individual sites. It's complicated, juggling everything that's going on in dual match, but ESPN has done such a good job in covering the slams lately, expectations are high for anything presented under its brand. That said, it was great to see college tennis streamed, and I hope I can watch a few more of the six matches remaining on the streaming schedule. The complete College Match Day schedule is here. For the Florida recap of the match, see this Gatorzone article. The other big match Friday was in Columbus, Ohio, where the top-ranked Ohio State men were facing No. 12 North Carolina. The Buckeyes took the doubles point with Peter Kobelt and Kevin Metka taking a tiebreaker from Nelson Vick and Oystein Steiro at line 1 after the teams had split at 2 and 3. In singles, the Buckeyes got wins from Hunter Callahan at line 6, with Callahan beating former Buckeye Vick 6-3, 6-0, and Ralf Steinbach at line 5, who downed Steiro 6-4, 6-3. Tar Heel freshman Brayden Schnur, who in just two months of college tennis is ranked 19th, had taken the first set from Kobelt at 1, in a tiebreaker, but once Metka took his first set from Esben Hess-Olesen at line 4, also in a tiebreaker, Ohio State was in control. Brett Clark defeated Chris Diaz 6-3, 6-1 at line 3 to give North Carolina its point, but Metka closed it out with a 7-6, 6-4 win over Hess-Olesen. The box score is here. It was Ohio State's 182nd straight win at home, a streak that dates back to April of 2003. My Tennis Recruiting Network article (subscription required for the complete piece) on that streak is here. 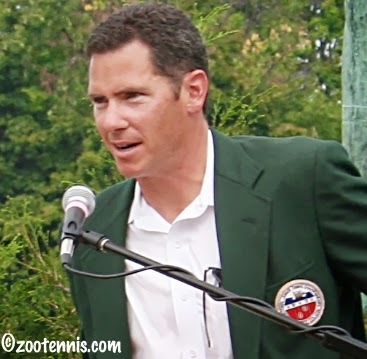 The ITA announced seven new members of its Men's Collegiate Hall of Fame today, with former USTA Kalamazoo Nationals Tournament Director Timon Corwin among those being inducted on May 21st in Athens, Georgia. Corwin, the 1986 NCAA Division III singles and team champion while a student at Kalamazoo College, returned to the school to coach the men's team and take over as director of the Nationals in 1993. He continued to hold those two positions through 2007, when he left to become USTA's Director of Junior and Collegiate competition. In 2011 he and his family returned to Wisconsin, where Corwin is now general manager and director of tennis at the Western Racquet Club in Elm Grove. Two other coaches have been inducted: the University of Mississippi's Billy Chadwick, who is retiring this year, and Oklahoma State's James Wadley, who retired in 2012. Three players are included in this year's class: Stanford's Alex Kim, Southern Cal's Matt Anger and Juan Farrow of Southern Illinois University-Edwardsville. One contributor, Doug Conant, former CEO of Campbell Soup Company, is also being inducted. For more on all seven men being honored, see the ITA's release. At the $10,000 Sunrise Futures today, three US teenagers picked up wins. Seventeen-year-old wild card Deiton Baughman reached his first Futures quarterfinal with a 7-5, 5-7, 3-0 ret. victory over qualifier Samuel Bensoussan of France. Kalamazoo champion Collin Altamirano, 18, who collected his first ATP point in last week's Futures, reached the quarterfinals with a 6-3, 6-2 win over unseeded Daniel Dutra da Silva of Brazil. Qualifier Francis Tiafoe, 16, has reached his second Futures quarterfinal this year with an impressive 6-3, 6-4 win over No. 4 seed Dennis Nevolo, the former Illinois All-American. In addition to their singles success, Altamirano and Baughman have reached the doubles final this week, after capturing the title last week in Boynton Beach. Altamirano and Baughman, who are unseeded, will face top seeds and former Florida State teammates Jean Yves Aubone and Vahid Mirzadeh in Friday's final. Another College Match Day is scheduled for Friday at 5 p.m., with the No. 9 Texas A&M women traveling to Gainesville to take on No. 5 Florida. The matches will be streamed on ESPN3. For more on the SEC battle, see the Florida website. The ITA Division III Women's Team Indoor is on tap for this weekend at Depauw University in Indiana. Like the Division III men's Indoor, it lacks the top New England teams, with the seventh-ranked Johns Hopkins team the No. 1 seed in the tournament. In addition to Johns Hopkins, the defending champions, seven other teams are competing, in order of seeding: Chicago, Carnegie Mellon, Pomona-Pitzer, Redlands, Washington University, DePauw and UC Santa Cruz. See the ITA tournament page for a preview and the draw. For my Tennis Recruiting Network article on the College Match Day that I attended last Saturday at Notre Dame, I talked to three coaches, player Greg Andrews and Elissa Hill of the USTA, getting their thoughts on the doubles-last format and the reason the USTA has mandated that format for this year's College Match Days. I remain unconvinced that this format has the best interests of the student-athletes or the existing college tennis fans at heart, for the reasons I stated back in September, when this format was revealed. As I said back then, I think we are all tired of the structure and format changes than have been inundating junior and college tennis here in the US the past several years, but I sense there are more to come. 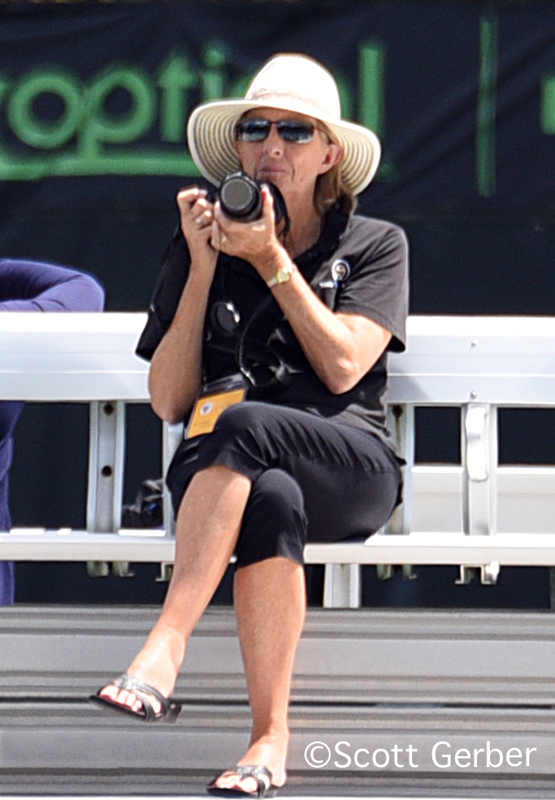 Over at Parenting Aces, Robert Sasseville, a stalwart of junior tennis in the United States for decades, has put together a history of the USTA changes in the rankings and the junior competitive structure, and the reasons behind them. Although it is long, it is thorough and easy to follow, and should be required reading for every parent, coach, administrator and yes, player, who participates in a USTA-sanctioned event. He explains what has changed (spoiler alert-- a lot) in society and the sport the past three decades and how they have led to the constant attempts to make the rankings and the junior competitive structure better. Meanwhile, in the ITF junior competitive structure, I am aware of only two major changes the past 15 years--a move to a combined ranking (including singles and doubles), and no-ad for doubles, following the ATP, WTA and ITF Professional tours. There are many complaints about the ITF's lack of vision in improving Davis Cup and Fed Cup, but there is something to be said for that stability when you see the chaos caused by those who think they always have a better way and have the power to implement those ideas, regardless of any objections. I would love if it someone with Sassaman's depth and breadth of experience would write a similar history for Division I college tennis. The BNP Paribas Open, which begins next Monday in Indian Wells with women's qualifying, has announced its wild card recipients. Main draw wild cards went to Nadia Petrova and Vera Zvonareva of Russia, teenagers Donna Vekic of Croatia and Belinda Bencic of Switzerland, and Americans Donald Young, Jack Sock, Ryan Harrison, Steve Johnson(USC), Rhyne Williams(Tennessee), CoCo Vandeweghe, Shelby Rogers, Vicky Duval and Taylor Townsend. I'm puzzled why Bradley Klahn didn't receive one, as he is the No. 3 American, ranked higher than all five of the men who did get a wild card. Qualifying wild cards were given to USC's Raymond Sarmiento and UCLA's Clay Thompson, 16-year-old Stefan Kozlov, Irina Falconi(Georgia Tech), Madison Brengle, Grace Min and Allie Kiick, all from the US. Australian Thanasi Kokkinakis and Great Britain's Heather Watson also received qualifying wild cards. As it has in years past, the tournament is running a pre-qualifying event, with a qualifying wild card up for grabs. UCLA's Dennis Novikov, Nick Meister and Dan Kosakowski are all entered in that tournament, now into the third round. Nicole Gibbs(Stanford), Sanaz Marand(North Carolina), Keri Wong(Clemson), Denise Muresan(Michigan) and Danielle Lao(USC) are just a few of the women competing in a very strong field. On Tuesday, 16-year-old Ena Shibahara, the 16s International Spring and USTA Winter National champion last year, beat the ITF World Junior No. 6 Louisa Chirico in a second round match. Complete draws can be found here. The ITA's first rankings of the season generated via computer were released today, with the Ohio State men and the Duke women retaining the No. 1 positions they were granted by the polling method used until now. Ohio State defeated then No. 10 Notre Dame 4-2 last Saturday (my account of the match is here) and has yet to lose this season, but the Duke women were upset 5-2 last Friday by Virginia. Virginia moved up to No. 3 in the rankings, while the men's team dropped all the way down to No. 10. If that doesn't sound quite right, and I agree it doesn't, wait for at least another set of rankings before putting too much stock in the computer. For the ITA's Frequently Asked Questions about the singles, doubles and team rankings, see this document. For an alternative set of rankings for the men, see the Texas College Tennis blog, which deviates quite a bit from the ITA's after No. 1 and No. 2. Odd not to see North Carolina and Cal in the Top 10, with the Tar Heels falling to 11, and Cal from 4 to 14. The Bears did lose to Southern Cal 6-1 last Saturday in Los Angeles. The individual rankings didn't change either, at least the singles No. 1 didn't, with North Carolina's Jamie Loeb and UCLA's Clay Thompson once again at the top. Stanford has all six of its starting lineup--Ahn, Taylor Davidson, Carol Zhao, Caroline Doyle, Ellen Tsay and Krista Hardebeck--in this ranking period's Top 40. Davidson, Zhao and Doyle are freshmen. For complete rankings, see the ITA ranking page. A year ago at this time, Virginia's Jarmere Jenkins and Clemson's Yannik Maden were both preparing for the conference season and the upcoming NCAA tournament. Over the weekend, both won their second Futures titles since finishing school, with Jenkins taking the $15,000 Futures in Australia, and Maden the $10,000 Futures in Boynton Beach, Florida. Jenkins was the top seed in Australia, but his run to the final was anything but easy, as he needed to come back from a set down in three of his five wins. In the final, Jenkins took out No. 4 seed Luke Saville of Australia, the 2011 Wimbledon boys champion, 6-2, 6-3, to take his second ITF Men's circuit title, and first since he won the Rochester Futures on clay back in June of 2013. Maden, who was an All-American in doubles for Clemson with his younger brother Dominique in 2013, won nine matches in Boynton Beach, four in qualifying and five in the main draw. Maden, a 24-year-old from Germany, didn't face a single seed in the main draw. In the final, he defeated 2012 NCAA finalist Eric Quigley of Kentucky 7-6(5), 6-1 to take his second title. He won a $10,000 Futures in Germany, also on clay, back in September. 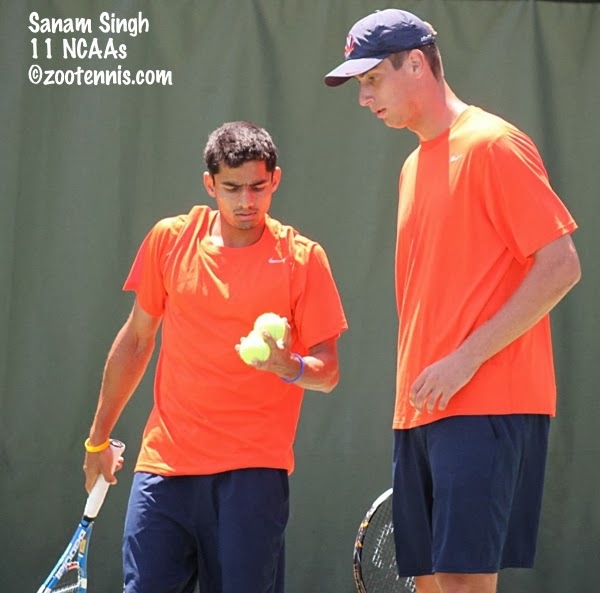 Jenkins was hardly the only former Cavalier to have success, with two-time NCAA champion Somdev Devvarman taking the title at the $100,000 New Delhi Challenger, and Sanam Singh capturing his second straight doubles title at the Challenger level. The second-seeded Devvarman, now 29, moved to No. 78 in the ATP rankings with his 6-3, 6-1 win in the final over fellow ITA Player of the Year Aleksandr Nedovyesov (Oklahoma State) of Kazakhstan, who was the top seed. Singh won the doubles title in New Delhi with former Alabama star Saketh Myneni after winning the title at the $50,000 Challenger in Kolkata with Myneni the week before. Both from India, Singh and Myneni were unseeded wild cards in the two tournaments. Robert Farah, the 2008 NCAA doubles champion at USC, won his first ATP title Sunday, in his fourth appearance in a final. Farah and fellow Colombian Juan Sebastian Cabal, who were unseeded, beat the No. 3 and No. 1 seeds en route to the final at the ATP 500 in Rio, where they downed No. 2 seeds Marcelo Melo of Brazil and David Marrero of Spain 6-4, 6-2. They are now ranked No. 5 in the ATP doubles team rankings. Another NCAA doubles champion, the Bryan brothers(Stanford), picked up another ATP title, their 94th, at the ATP 250 in Delray Beach. Kevin Anderson, the NCAA doubles champion at Illinois in 2006, played only singles, reaching the final at Delray Beach before falling, in over three hours, to Croatia's Marin Cilic. Anderson had beaten qualifier Steve Johnson(USC) in the semifinals, while Cilic had taken out John Isner(Georgia) in their semifinal. The doubles title in Boynton Beach went to unseeded teens Deiton Baughman and Collin Altamirano. Baughman and Altamirano, who received a wild card, beat top seeds Daniel Garza of Mexico and Darian King of Barbados 6-4, 6-4 in the final. At the women's $25,000 Pro Circuit event in Surprise, Arizona, No. 4 seed Jovana Jaksic of Serbia defeated unseeded Tamira Paszek of Austria 4-6, 7-6(13), 7-5, saving 14 match points, to win the singles title. Shuko Aoyama and Eri Hozumi of Japan, the top seeds, won the doubles title with a 6-3, 7-5 victory over unseeded Sanaz Marand and Ashley Weinhold, who were frequent doubles partners back in their junior days in Texas. There are no Pro Circuit events for women in the United States this week. The men are back in Sunrise, Florida, for the third $10,000 Futures of the year there. Qualifying was completed today, with Sameer Kumar and Francis Tiafoe among those winning four qualifying matches to reach the main draw. Michael Mmoh, Dennis Uspensky, Altamirano and Baughman received wild cards into the main draw. US Open girls finalist Tornado Alicia Black, 15, received a wild card into the main draw of the WTA tournament in Acapulco this week and will play her first WTA main draw match against Serbia's Bojana Jovanovski, the No. 6 seed, later tonight. For more on Black, see this article from SI.com. Top-seeded Washington University (St. Louis) won the ITA Men's Division III Team Indoor championship today in Cleveland, beating Johns Hopkins 6-3 in the final. Although long a national contender, with NCAA Final Four appearances the past six years (and a title in 2008), this is the first Team Indoor title for the Bears in four appearances in the final. Johns Hopkins, the No. 6 seed, had never reached a Team Indoor final before, and despite their loss today, have established themselves among the elite in Division III men's tennis. The complete draw and results can be found at the ITA tournament page. For a comprehensive look at the whole tournament, with a breakdown of its winners and losers, see the division3tennis.com blog. After all the experiments in Division I college tennis, I'm struck how stable the format has been in Division III, with three doubles points decided in eight-game pro sets first, then six singles matches played with standard scoring. They do limit their National Championships to eight teams however. Could this be the key to silencing the constant calls for change in Division I? The big match in women's Division I tennis today was No. 3 Stanford hosting No. 5 Florida, but it proved to be a disappointment, especially in light of their recent history of dramatic matches, with Stanford winning 7-0. For a complete recap, see the Stanford website. The men's Top 10 match Sunday proved more exciting, with No. 5 Oklahoma defeating No. 8 Texas A&M 5-2 in Norman. After the Sooners won the doubles point, the teams split four matches in straight sets, but Oklahoma won the two three-setters, with Alex Ghilea defeating Max Lunkin 5-7, 7-5, 6-2 at line 6 to clinch it. For more, see the Texas A&M website. At the Blue Gray Tennis Classic in Montgomery, Alabama, the Boise State men repeated as champions, defeating Virginia Commonwealth 4-2 in the final. The women's championship went down to the wire, with Alabama defeating Rice 4-3. It was decided in a match tiebreaker in lieu of a third set, with Mary Anne Daines defeating Natalie Beazant at the No. 1 position to give the Crimson Tide the title. The ITA format experiment, which I thought concluded at the Team Indoor Championships, was extended to include this tournament. ITF junior action is sparse in late February, but Sydney Riley of the US picked up her first ITF title, winning the Jalisco, Mexico Grade 4 on clay. The 16-year-old Texan, who was a finalist at the same tournament last year, beat unseeded Daniela Morales Beckmann of Mexico 6-7(5), 7-6(4), 6-4 in the championship match. Riley was the No. 4 seed. Megan Horn of the US teamed with Ariana Rahmanparast of Costa Rica to win the girls doubles title over top seeds Jessica Hinojosa Gomez and Ana Luisa Perez Lopez of Mexico 7-5, 5-7, 10-5. It was loud, it was crowded and an upset was in the air at the Eck Tennis Pavilion Saturday afternoon, when top-ranked and recently crowned ITA Team Indoor champion Ohio State fell behind host Notre Dame 2-0. 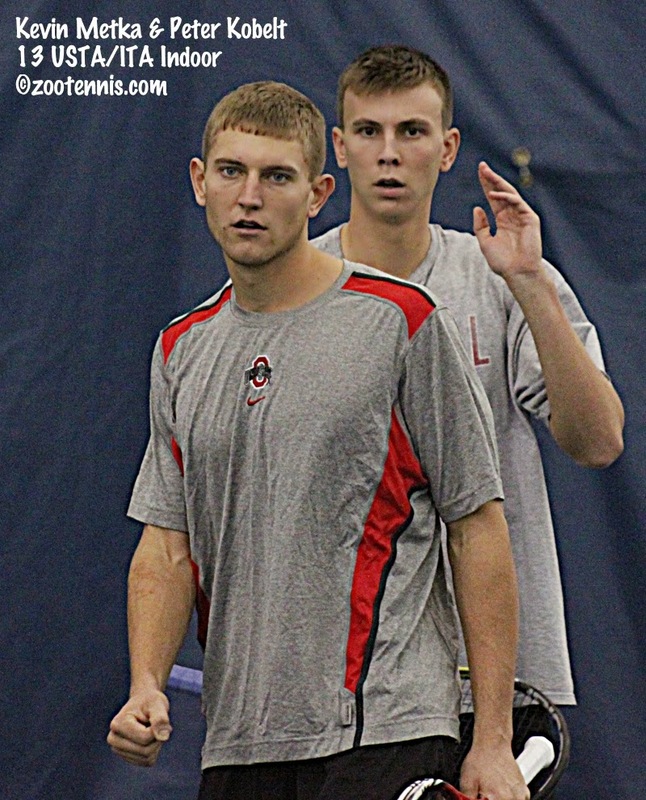 The Buckeyes had lost the doubles point, and when Notre Dame's Ryan Bandy defeated Ralf Steinback 6-3, 6-3 at No. 4 singles, Ohio State needed to win four of the remaining five matches to stay undefeated. They did, with Peter Kobelt clinching a 4-2 victory with a razor's edge 6-7(5), 7-6(4), 7-6(2) win at No. 1 over Greg Andrews. The crowd of nearly 500 was shouting itself hoarse in support on the Fighting Irish, with the noise in the bleachers above the six courts drowning out the chair umpires on the courts below. They had plenty to cheer about in the doubles, with Billy Pecor and Josh Hagar at No. 2 and Eric Schnurrenberger and Bandy at 3 both coming back from a break down to give Notre Dame the 1-0 lead. Schnurrenberger and Bandy trailed Ohio State's Chris Diaz and Ralf Steinbach 5-2, only to rattle off the next six games. 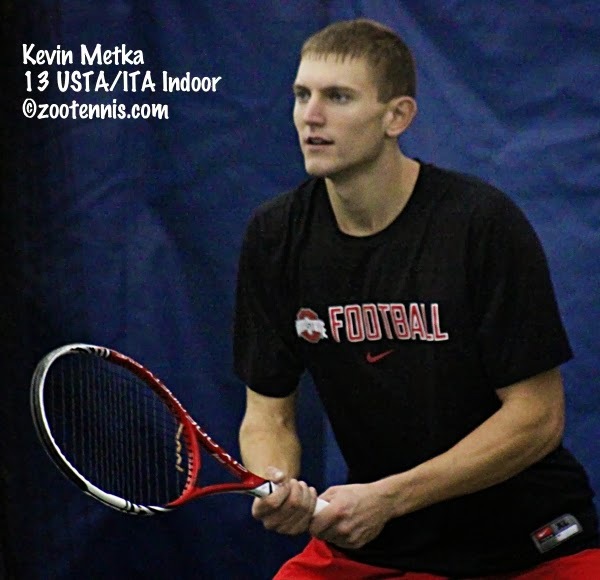 Kobelt and Kevin Metka took a 8-7(1) decision over Andrews and Alex Lawson at line 1 to briefly pull the Buckeyes even, but by that time Pecor was serving for the point, and he had no difficulty closing out the 8-6 win. Ohio State didn't exactly come roaring out of the gate in the singles, but they did pick up first sets at line 6, with Callahan taking it over Schnurrenberger, and at line 5, with Metka securing his first set over Ed Covalschi. But at 1, 2 and 3, the Buckeyes could get no advantage, with all three going to a tiebreaker in the first set. Andrews got his first set for Notre Dame, but it was Diaz, over Quentin Monaghan at line 2, and Herkko Pollanen, over Hagar at line 3, in an 80-minute first set, taking their tiebreakers to give the Buckeyes a boost. Callahan's 6-4, 6-4 win over Schnurrenberger also gave the Buckeyes some momentum, cutting the Irish lead to 2-1, but by that time Covalschi had taken the second from Metka and Kobelt was serving at 5-6 in the second set against Andrews, so Ohio State remained on the edge. Kobelt held to force a second tiebreaker, and he served well in it, getting two minibreaks and finishing it out with an unreturnable serve. Diaz then picked up a huge point for the Buckeyes, making it 2-2 with a 7-6(4) 6-4 win over Monaghan at 2. Covalschi and Metka were on serve as their third set continued, as were Kobelt and Andrews, with Hagar going up 5-2 in the second over Pollanen at 3. Metka had two match points with Covalschi serving at 5-6, but he couldn't convert either. "I got two forehand returns, which I wanted," said the left-hander from Worthington, Ohio. "On second serves, and I blocked both of them deep. But luckily I got up quickly in the third set tiebreaker, and that helped me have confidence to hit my serves and close it out." Metka made it 3-2 Ohio State with his 6-3, 3-6, 7-6(2) victory, meaning that now Notre Dame had to win both matches still on court. Andrews, serving from behind, had no trouble reaching the third tiebreaker of his match with Kobelt, and Hagar had taken the second set from Pollanen with a break at 4-5, after being unable to serve it out at 5-3. Kobelt started the third set tiebreaker with a double fault, and actually did not serve well, getting only one first serve in throughout. But Andrews, who put himself in position to win points, made errors he had not made up until then, with a double fault and a couple of missed volleys costing him dearly. At 6-2, Kobelt again failed to get a first serve in, but Andrews's backhand found the net, and the disappointed crowd went completely silent. Kobelt, who had shown almost no emotion, even at the most crucial junctures of the match, turned toward the crowd, stretching both arms out wide. "I knew it was coming down to our court," said the 6-foot-8 senior from New Albany, Ohio. "It was our first away match and they came out and laid it on us in the doubles point. It was just a great moment to pull through for the team again." Kobelt wasn't surprised that he was in such a battle with Andrews, also a senior. "I've played Greg a handful of times, and every time I've played him, it came down to a third set, and a lot of tiebreakers," said Kobelt, who didn't break or get broken in the match. "I wouldn't say I returned bad, I had maybe five or six break points that he played really good points on, so you've got to tip your hat. He's a good player, and that's what I had to expect, that he'd come up with his shots, and he did. That's why the match came down to a third set tiebreaker." Ohio State head coach Ty Tucker knew his team would have its hands full with the Fighting Irish. "College tennis is tough," said Tucker. "When you're indoors, on the road, coming into a new environment, it's tough. Notre Dame's a tough, tough team. At the National Indoor, they beat Florida, they beat Mississippi State, they played Virginia tight. We knew when (Blaz) Rola didn't come back, 4-2s and 4-3s were going to be our math to get out." Notre Dame head coach Ryan Sachire praised the Buckeyes for fighting their way out of a tight spot. 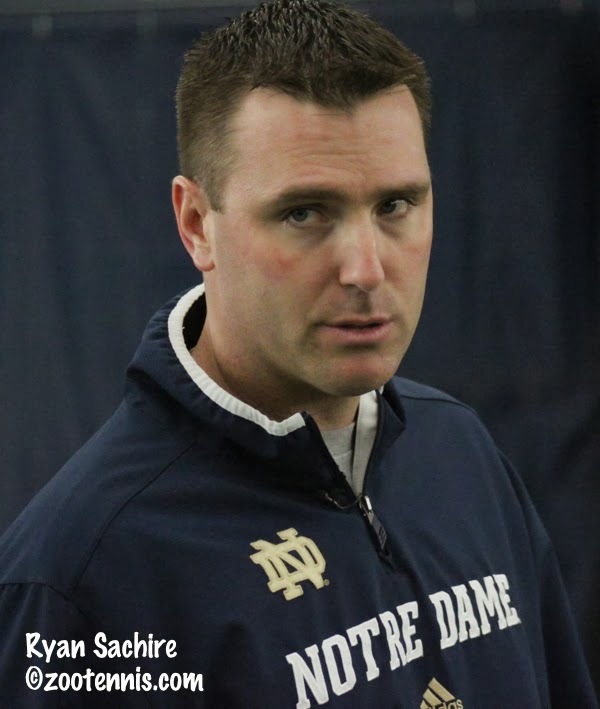 "Give Ohio State a ton of credit," said Sachire, in his first year as Notre Dame head coach, after seven years as assistant to Bobby Bayliss. "We gave them a big punch, backed them into a corner and they were in a situation where they won National Team Indoors, are ranked No. 1 in the country, they have a lot to defend, if they chose to look at that way. A sign of a champion is when you do get backed into the corner, in a situation when you do feel you have something to lose, and you're able to come through. And they did." 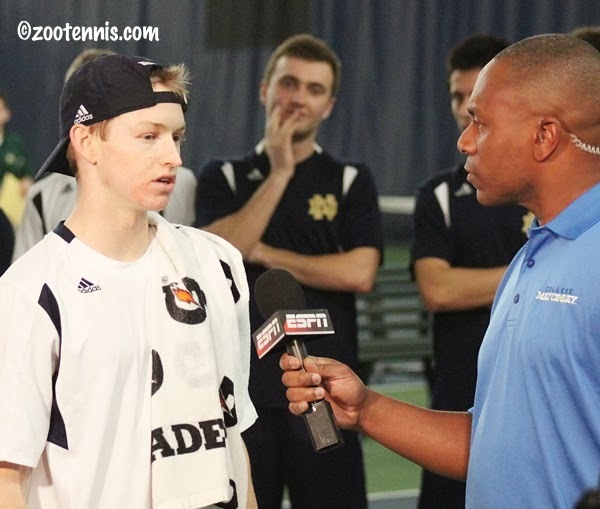 Notre Dame had an immediate chance to get back on the winning track, taking on Ball State Saturday evening in the USTA's College Match Day. The reason the Ohio State match was not streamed as part of the College Match Day was Tucker's reluctance to play the mandated format used in streamed matches, with doubles played only if singles are tied at 3-3. "Let's be honest. If ESPN doesn't want to do a match with regular scoring like they just saw, I can't help them," Tucker said. "That was a big-time match. They were crazy they didn't have their cameras out there getting that match. That was as good as it gets. If I would have wanted to play College Match Day, with different experiments with formats, I would have asked to have one at our home. I want to play regular rules, put my guys in the best position to win, and that's what I was doing." "They opted not to play the College Match Day format," said Sachire. "We bid on it with Ohio State being the intended College Match Day match, and Ohio State refused to play under that format. That was their choice and their right to not play that format, so we're happy that the USTA was nice enough to allow us to play Ball State." The second part of my interviews with college coaches and others about the ITA format experiment, which I conducted at the Women's Team Indoor last week in Charlottesville, is up today at the Tennis Recruiting Network. In addition to five more of the top Division I women's coaches, I also spoke to Mitchell Frank, the University of Virginia No. 1, who is against changing the format, and Dustin Taylor, the National Coach for Collegiate Tennis at the USTA. Taylor, who was at every women's match, watching all the American players he could over the four days, is concerned a format change may dissuade the top juniors from going to college, just when that pathway to pro tennis is gaining credibility. Although it is just one small ATP tournament in Florida, the results at Delray Beach make the point. Steve Johnson, the two-time NCAA singles champion from USC, has reached his first ATP semifinal with a 6-3, 6-2 win over No. 6 seed Feliciano Lopez of Spain, after taking out top seed Tommy Haas in the second round. Kevin Anderson(Illinois) is also through to the semifinals, and there will be another collegiate semifinalist in the winner of tonight's quarterfinal match between John Isner(Georgia) and Rhyne Williams(Tennessee). Not to mention Stanford's Bradley Klahn, who is now the No. 3 American, behind Isner and Sam Querrey. So as college tennis experiments with scoring changes (and I'm with Texas A&M's Howard Joffe, who hasn't heard a good reason for such a change, on this one), the old format has done an excellent job of preparing the best Division I (including doubles) players for a career on the next level. I would like college tennis to be more popular. I would like to see the stands full, and the atmosphere at an important conference match like that of the North Carolina - Duke men's basketball game last night. But I don't want the sport to be diluted beyond recognition to try to do that, especially when there is no guarantee such drastic measures would actually produce a huge group of new fans. A couple of days ago, I tweeted a link to this Sports On Earth article by Will Leitch about Lolo Jones and US bobsledding. Although I'm not aware that any celebrity athlete is being recruited to join a college tennis team for the publicity, the big picture question that Leitch raises certainly can be applied to college tennis. "Team USA was looking for a boost, a way to break through to the mainstream, a way to grab eyeballs. This was an undeniable mistake. It offended the fans of the sport, it put Jones in the position of looking like both the bad guy and a bobsled failure (neither of which are true), it made those in charge of the sport look they like didn't trust their own product and it didn't even bring any tangible financial benefits. This is how you get that delicate balance incredibly wrong. Those in charge of U.S. bobsledding turned Lolo Jones into a glowing puck." I believe looking for improvements to the Division I college tennis experience is a worthwhile endeavor, but the "we have to do something" panic that has set in during the past two years is leading to decisions that are threatening the delicate balance Leitch describes. I know the Division I college tennis product; it's great. Be careful. The ITA announced the all-tournament team for the Men's Team Indoor, which Ohio State won on Monday, beating Southern Cal 4-1. 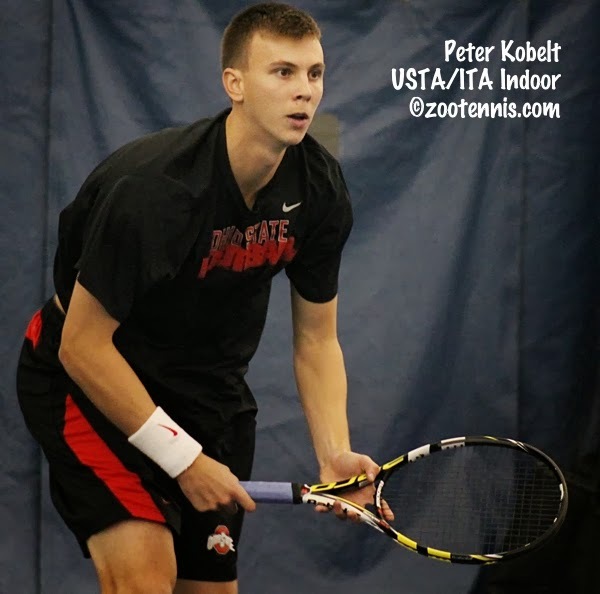 Peter Kobelt of Ohio State was named the tournament's Most Outstanding Player. I'm looking forward to the No. 1 ranked Buckeyes against No. 10 Notre Dame tomorrow in South Bend, my first men's dual match of the season. The seventh annual BNP Paribas Showdown at New York's Madison Square Garden is scheduled for Monday March 3, as a part of World Tennis Day. This year's participants are Andy Murray, Novak Djokovic, the McEnroe brothers and the Bryan brothers, along with two US juniors just added to the exhibition--Francis Tiafoe and Reilly Opelka. Tiafoe and Opelka will likely play each other prior to the start of the competition between the bigger names. The Showdown does not always include junior players, but Sloane Stephens, Denis Kudla and Nicole Gibbs have participated in the past. The complete release is here. The Sun-Times' Hinsdale, Illinois section provided this feature on Axel Nefve, one of the four US boys who made the trip to Europe for the Nike Teen Tennis and Les Petits As tournaments in January. According to the article, Nefve was returning "home" for the latter, because he was born in France and lived near Roland Garros until he was six years old. No one expects college coaches of non-revenue sports to earn what their football and basketball colleagues command, but this Santa Cruz Sentinel article, headlined "Poor Sports", shows just how dire the situation is for some of them at Division III UC-Santa Cruz. Coaches made up three of California's five highest-paid employees in 2012. Each earned at least $1.9 million annually to lead nationally prominent NCAA Division I programs rich with boosters and sport history. UC Santa Cruz men's tennis coach Bryce Parmelly, meanwhile, made $19,856 without benefits that year while living in a carpeted garage with two space heaters, a small couch and a mattress on the floor. Parmelly resigned this fall after two years at the program's helm, citing the lack of a living wage. His salary is typical for most coaches at UCSC -- which features 14 teams that compete at the NCAA D-III level. Slugs coaches find themselves at the other end of the pay scale from their D-I brethren despite handling a workload they say is equal to, if not greater than, their higher-paid counterparts. I would add that this is not just a D-III vs D-I problem, but one that extends to many non-revenue sports, including tennis, in all divisions. Two alternatives to the ITA men's team rankings have been released. CollegeTennisOnline has Ohio State No. 1 and USC No. 2, as do the ITA and TexasCollegeTennis.com. Not content to ranking the Top 25 or the Top 75, Texas College Tennis ranks every Division I program. The Division III Men's Team Indoor begins Friday at Case Western Reserve in Cleveland, with Kenyon the defending champions and Washington University the top seed in the eight-team field. The draw, preview and live updates can be found at the ITA tournament page. Another detailed preview, with predictions, can be found at division3tennis.com. As I mentioned last week, I spoke to most of the women's coaches about the ITA's experimental format when I was in Charlottesville, Va. for the Team Indoor Championships. 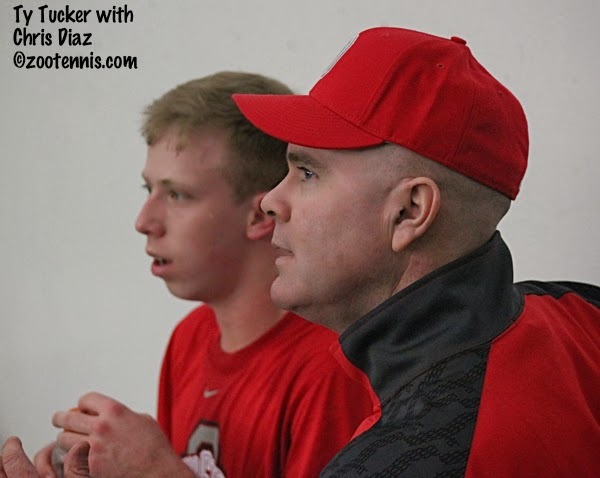 Part one of the article presenting those views is up today at the Tennis Recruiting Network, with part two scheduled to appear on Friday. Frankly, I was surprised at how unpopular the format was with everyone I spoke to. I'm not sure with this kind of opposition how it even made it to the experimental stage, but it did, although I would be even more surprised if it was adopted permanently. Speaking of that, in my research for the article, I came across this NCAA article from 2000, when similar experiments were being undertaken for similar reasons. I wasn't covering college tennis back then, but I was shocked at how familiar this all sounds. It appears that format change is a battle never won, only postponed. Cal's Jan Brogan is now retired and a volunteer assistant in Berkeley, Brian Boland is no longer at Indiana State, of course, and in fact, only Georgia's Manny Diaz of the coaches quoted hasn't changed jobs in those 14 years. The "return to doubles for overtime" from back then appears to be dead, but as we've seen with the College Match Day format, there's no statute of limitations on resurrecting rejected ideas from past experiments. Also, don't miss the comments on the Men's Team Indoor, and the no-ad scoring format from Russ, who was in Houston for the tournament. His comments can be found, in their entirety, here. What do you think about the new rules being tested in college tennis? Doubles matches go to six instead of eight. In women’s singles, the third set is a super tiebreak. The men are playing two out of three with no-ad scoring. We have a great sport. You don’t go to Wimbledon and stay for a match. You stay for the day. It’s an event. There was a time where we had no-ad scoring, which I actually loved. But I don’t think changing the scoring is going to bring more people. I think you’re either a tennis fan or you’re not or you’ve got a buddy or a girlfriend on the team and that’s why you’re going to go out. I just don’t think someone who doesn’t understand tennis is going to be coming in off the street to watch it. When [the women] play regular scoring with a tiebreak in the third set and the men are playing no-ad scoring and playing out two out of three sets – that’s not fan friendly. Our fans our going, “What is this?” We have it printed all out in their programs, but they still get confused. Is that fan friendly? I’d rather it be all the same. Secondly, if they are [shortening matches] for TV, it takes $40,000 to bring a truck and a generator, probably seven cameras on six courts. And it might rain! It’s tremendously expensive. I think the future of tennis as far as viewing goes is streaming. When I asked the USTA about the new rules, they explained TV producers said they had to do the match in 2.5 hours. So I think that’s one reason this is coming out. I’m old school. I like regular scoring. As a coach, I loved the long matches. One time we were playing indoors with 7,000 people against UCLA and we had already played four hours. We came indoors at 6:30 p.m. and the match ended at 12:45 a.m. and no one left. The place was going wild! A qualifying wild card into the WTA Family Circle Cup in Charleston, South Carolina has always attracted some big names into the girls 18s draw for an otherwise unremarkable USTA tournament in South Carolina. The past two years, North Carolina's Hayley Carter, now a Top 10 ITA player as a freshman, won the tournament and the wild card that goes with it. This year, the ITF's No. 2 junior and Orange Bowl champion Vavarva Flink of Russia entered the tournament, and was the top seed, with Kaitlyn McCarthy, No. 3 in the USTA's 18s rankings, the No. 2 seed. Terri Fleming and Laura Patterson were the No. 3 and 4 seeds, but it was 16-year-old Ellie Halbauer, one of four No. 5 seeds, who won the tournament and the wild card. Halbauer, who now lives and trains in Boca Raton, Florida, is from the Charleston area, and back in October, she won a $10,000 Pro Circuit tournament in Hilton Head. Halbauer certainly earned her wild card, beating Flink 4-1, 4-2 (rain made short scoring a necessity early) in the quarterfinals, Patterson in the semifinals, 6-0, 6-2 and, in Sunday's final, McCarthy, 3-6, 6-2, 10-8. Complete draws can be found at the TennisLink site. Charleston's The Post and Courier provides an account of the match and quotes Halbauer in this article. Qualifying for the Family Circle Cup begins on March 29th. Americans were shut out in the three Pro Circuit events last week in the United States. At the $100,000 Midland women's challenger, Heather Watson of Great Britain won both the singles and doubles titles. The unseeded Watson defeated Ksenia Pervak of Russia, also unseeded, 6-4, 6-0 in the singles final. Watson and partner Anna Tatishvili of Georgia, seeded fourth, took the doubles title with a 7-5, 5-7, 10-6 win over No. 2 seeds Sharon Fichman of Canada and American Maria Sanchez(USC). At the $25,000 women's tournament in Rancho Santa Fe, No. 5 seed Tamira Paszek of Austria won the singles championship, defeating unseeded Shuko Aoyama of Japan 6-1, 6-1 in the final. Paszek had beaten Sanaz Marand(UNC) in the semifinals, after Marand had taken out top seed Sachie Ishizu of Japan in the second round. Connie Hsu(Penn), Mayo Hibi, Danielle Lao(USC) and 16-year-old Emma Higuchi all reached the quarterfinals. Samantha Crawford of the US, who turns 19 today, teamed with Yi-Fan Xu of China to take the doubles title. No. 3 seeds Crawford and Xu defeated unseeded Lao and Keri Wong(Clemson), 3-6, 6-2, 12-10 in the final. At the $10,000 Futures in Sunrise, Florida, 18-year-old Yoshihito Nishioka of Japan, the No. 4 seed, won his fourth career Futures title, defeating unseeded Tiago Lopes of Brazil 6-2, 6-3. Greg Ouellette(Florida) was the only American to reach the quarterfinals. Mexicans Daniel Garza and Hans Hach, seeded No. 3, defeated the Austrian team of Marc Rath and Nicolas Reissig, the No. 2 seeds, 7-6(4), 6-4 in the final. In a $10,000 women's ITF tournament in Spain, Southern Cal recruit Madison Westby and South Carolina recruit Hadley Berg won the doubles title. The wild cards defeated No. 3 seeds Yoshimi Kawasaki and Yumi Nakano of Japan 6-4, 6-2 in the final. This week, the Pro Circuit events include the $25,000 women's tournament in Surprise, Arizona, and another $10,000 Futures for men, in Boynton Beach, Florida. Nathan Ponwith, Deiton Baughman and Collin Altamirano qualified, winning four matches to reach the main draw. In Arizona, Sachia Vickery, 14-year-old CiCi Bellis, Meredith Xeopoleas and Jacqueline Cako(Arizona State) are among those qualifying today. There is also a big ATP Challenger in Mexico that has drawn a bundle of former college players, with today's schedule looking more like the 2011 NCAA championships than a $75,000 plus hospitality Challenger. The draws are here. And, speaking of the 2011 NCAAs, at the ATP Delray Beach tournament, the two singles finalists that year, Steve Johnson(USC) and Rhyne Williams(Tennessee), won their first round matches after qualifying over the weekend. Georgia dropped from No. 4 to No. 12, and Mississippi State also fell out of the Top 10, from 9 to 11. There were also a couple of changes in the women's Top 10, with UCLA overtaking Stanford for the No. 2 spot, and Virginia falling out of the Top 10 after a loss to Alabama. There were no new individual rankings this week. For complete team rankings, see the ITA ranking page. After Ohio State's dramatic 4-3 third-set tiebreaker victory over top seed Virginia on Sunday, a letdown in Monday's final against No. 3 seed Southern California would have been understandable. Instead, the fifth-seeded Buckeyes shed the bridesmaid role with a 4-1 win over the Trojans, claiming their first national team title after three runner-up finishes at the Indoor(2007, 2008, 2012) and one at the NCAAs(2009). Ohio State had dropped the doubles point to Virginia on Sunday, making their comeback from 3-1 down all the more impressive. The Buckeyes avoided a similar scenario in the final, with Peter Kobelt and Kevin Metka taking a 6-4 decision from Raymond Sarmiento and Yannick Hanfmann at line 1, and Chris Diaz and Ralf Steinbach clinching it at line 3 with a 6-4 win over Eric Johnson and Max DeVroome. USC's Roberto Quiroz and Connor Farren led Herko Pollanen and Hunter Callahan 5-3 when play was halted. In singles, the teams split first sets, with Kobelt, Steinbach and Callahan winning at lines 1, 4, and 6, and Hanfmann, Quiroz and DeVroome taking the opening sets at 2, 3, and 5. Unfortunately for the Trojans, they were unable to get a quick point from any of those three. Instead, Ohio State took a 2-0 lead when Callahan, who won all four of his singles matches in the tournament, beat Jonny Wang 6-3, 6-4 at line 6. Hanfmann closed the gap with a 6-5(4), 6-3 decision over Diaz at 2, but it didn't last long, with Kobelt making it 3-1 with a 6-3, 6-4 win over Sarmiento at 1. USC's Quiroz and DeVroome were up a set over Pollanen and Metka at lines 3 and 5, with the second sets in those two matches at 4-all. But Steinbach had broken Connor Farren at line 4 and was serving for the championship leading 6-5(4), 5-4. Farren had two chances to put the match back on serve in the second set, but lost both the 30-40 point and the deciding deuce point, with Steinbach coming into the net and hitting a tough backhand volley, then an easy forehand one to set off a huge celebration for the Buckeyes. (Match point was filmed by the ITA staff and is available here. The Ohio State website has quotes from head coach Ty Tucker, Steinbach and Kobelt in its article on the final. CollegeTennisOnline, which has a point-by-point account of the Metka - Thai Kwiatkowski third-set tiebreaker that decided the Virginia match, also will provide its account of the final, I'm sure. I will be seeing the newly crowned National Indoor champions for the first time this year on Saturday, when they travel to Notre Dame in what promises to be an excellent non-conference match. The Fighting Irish went 2-1 in Houston, beating both Florida and Mississippi State, with their only loss of the weekend to Virginia. For all the results and the ITA recap of the final, see their tournament page. The semifinals of the Men's Team Indoor couldn't have been much closer, with No. 5 seed Ohio State upending defending champion and top seed Virginia 4-3 in a third-set tiebreaker, and No. 3 seed Southern California taking out No. 2 seed UCLA 4-3, with the deciding match going to a third set. Those wins set up a rematch of the 2012 Team Indoor final in Charlottesville Virginia, which the Trojans won in another 4-3 thriller. Virginia won the doubles point, with Cavaliers Mac Styslinger and Thai Kwiatkowski coming back from a 4-1 deficit to beat Ralf Steinbach and Chris Diaz 6-5(1) at line 3, after Virginia had taken line 2 and Ohio State line 1. The two teams split first sets, with Peter Kobelt(1), Kevin Metka(5) and Hunter Callahan(6) winning their first sets for Ohio State, and Alex Domijan(2), Ryan Shane(3) and Justin Shane(4) taking first sets for Virginia. Down 1-0, Ohio State absolutely had to turn one match around, and as it turned out, four of the six matches went to a third set. Callahan tied the score with a straightforward 6-3, 6-4 win over Virginia freshman Jordan Daigle at line 6, but Ryan Shane returned the lead to the Cavaliers with the only other straight-set win, beating Herrko Pollanen 6-2, 6-5(5) at line 3. Chris Diaz had forced a third set against Virginia's Domijan at 2, with Steinbach doing the same at 4. Virginia's Mitchell Frank forced a third set against Ohio State's Kobelt at 1, and Kwiatkowski earned a third set against Metka at 5. 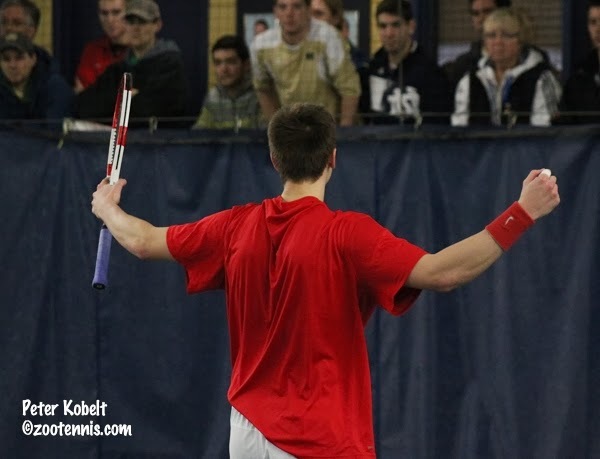 Domijan gave Virginia a 3-1 lead with his 6-1, 5-6(1), 6-4 victory, but Ohio State didn't relent. Kobelt made it 3-2 with a 6-3, 4-6, 6-4 win over third-ranked Frank, hitting three aces in the final game, including on match point, which was a deciding point in the no-ad format being used in the tournament. When Steinbach won a third set tiebreaker to defeat Ryan Shane 4-6, 6-2, 6-5(5), it was 3-3, and 2-2 in the final set of the Kwiatkowski - Metka match. After six straight holds, it was 5-all, and again, due to the format experimentation, the tiebreaker was played then, rather than at 6-all. (My account of the tiebreaker is based on the Twitter feed of Virginia men's tennis, which I truly appreciate, since there was no live streaming). Metka went up a mini-break early, taking a 5-3 lead, but gave the mini-break back to make it 5-4. Kwiatkowski was broken on his next serve, giving Metka two match points, but even with the second one on his serve, he couldn't convert. Metka had another match point at 7-6, but Kwiatkowski held both his serves, giving him his first match point. Metka had his fourth match point at 9-8, but again Kwiatkowski held serve, forcing a second change of ends. Kwiatkowski held for 10-9 and his second match point, but Metka won his next two serves to give himself a fifth match point at 11-10, and he converted that one for a 6-5(5), 5-6(5), 6-5(10) win that put Ohio State in its fourth Team Indoor final and ended Virginia's 36-match winning streak. 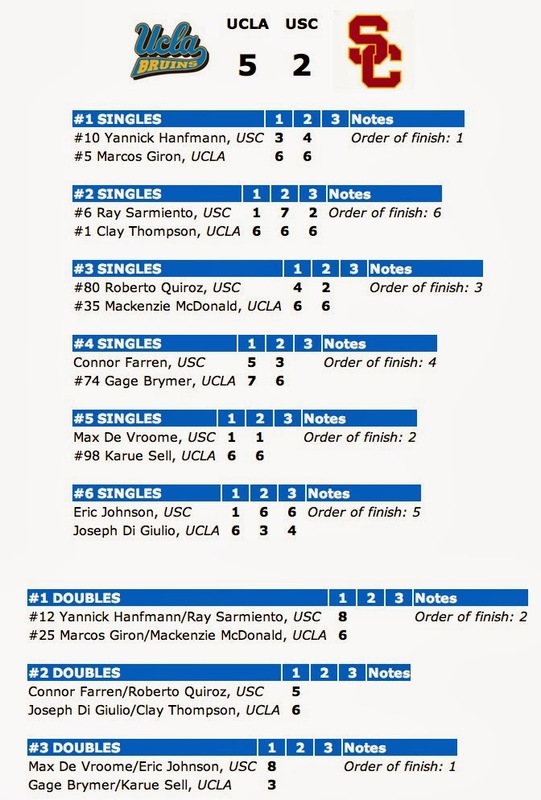 Southern Cal and UCLA were unlikely to top that finish, but their usual 4-3 score seemed likely, especially when USC took the doubles point with wins at 3 and 1, with 2 unfinished. Up 1-0, the Trojans won quickly at 5, with Max DeVroome taking out Dennis Mkrtchian 6-3, 6-0, and took a 3-0 lead when Roberto Quiroz dismissed Mackenzie McDonald 6-2, 6-4 at line 3. That 3 point cushion didn't last a minute, however, with Joe DiGiulio defeating Michael Grant 6-2, 6-3 at line 6 to make it 3-1, and Gage Brymer following with a 6-4, 6-4 win over Connor Farren at line 4. Clay Thompson won a second set tiebreaker from Ray Sarmiento at line 1 to make it 3-3, so the match would come down to Yannick Hanfmann and Marcos Giron at line 2. Hanfmann led 6-3, 3-6, 3-1 when all the attention turned to that court, but the junior never faltered, protecting his break and serving out the match for a 6-3, 3-6, 6-3 win that moved USC into the final for the third straight year. Monday's final is scheduled for noon Central. For more on Ohio State's victory, see their website. For more on USC's win, see their website. CollegeTennisOnline is also covering the tournament. The ITA tournament page is here. At the ITF Grade 2 in Bolivia, 16-year-old Raquel Pedraza captured her first ITF junior title, after reaching the final the previous week in the Grade 2 in Peru. Pedraza, the No. 4 seed, beat unseeded Gabby Andrews, also from the US, 7-5, 6-4 in the championship match. Andrews was playing in her first ITF event since last October's Pan American Closed in Tulsa, and only her second tournament of any kind this year. The girls doubles title went to Paraguay's Gabriela Ferreira Sanabria and Bolivia's Daniela Ruis, the No. 3 seeds, who beat No. 2 seeds Nicole Frenkel and Ellyse Hamlin of the US 2-6, 6-3, 10-7 in the final. The boys singles champion is Germany's Jan Choinski, the No. 2 seed, who beat Juan Jose Rosas of Peru, seeded sixth, 6-3, 6-7(5), 6-1. Kalman Boyd of the US, seeded No. 11, lost to Choinski in the semifinals. Rosas and Marcelo Barrios Vera of Chile, seeded second, won the doubles title, beating Eduardo Lourido of Ecuador and Juan Montes of Colombia, the No. 7 seeds, 6-1, 6-4. Pedraza was not the only American to collect an ITF junior title this weekend, with 16-year-old Mwenda Mbithi taking the singles championship at the Grade 5 in Kenya. Mbithi, the No. 2 seed, won his first ITF title by downing No. 4 seed Mateusz Smolicki 6-4, 6-3. At the Grade 1 in Morocco, top seed Jaume Munar Clar of Spain swept both singles and doubles titles in the boys draw, while unseeded qualifier Paula Badosa Gibert of Spain surprised No. 2 seed Sandra Samir of Egypt 6-4, 6-4 in the girls final. Unlike Friday, when half of the opening matches at the ITA Men's Team Indoor went down to the last match, none of the quarterfinal matches did, although three of them were closely contested 4-2 victories, with No. 5 Ohio State, No. 2 UCLA and No. 3 Southern Cal advancing to the semifinals by that score. Top seed and defending champion Virginia, who blew past No. 8 Cal 4-0 in an hour and 38 minutes, joins those three teams in the semifinals, the same four teams that reached final four last year. Ohio State was tested by No. 13 Texas, and was no doubt happy to have the doubles point when Longhorns Soren Hess-Olsen and Lloyd Glasspool earned straight-set wins over Peter Kobelt and Chris Diaz at No. 1 and No. 2 to give Texas a 2-1 lead. Hunter Callahan secured the Buckeyes' second point with a win at line 6, and Herkko Pollanen made it 3-2 Ohio State with a win over fellow freshman George Goldhoff. The final two matches were in third sets, and it was Kevin Metka who ended Texas' hopes, beating Nick Naumann 6-3, 4-6, 6-3 to put Ohio State into the semifinals for the fifth straight year. Ohio State is the only team to beat Virginia in the Team Indoor Championships since 2008, but the Cavaliers appeared much sharper in today's match against Cal than they did against Notre Dame on Friday, so the Buckeyes will need more from the top of their lineup to challenge the five-time Indoor champions. USC, who lost to Virginia in last year's final, also had the early lead, taking the doubles point and getting a quick win from Yannick Hanfmann at line 2. But No. 6 seed Baylor, even without injured No. 1 Julian Lenz, kept fighting, getting a point from Tony Lupieri at line 5 to make it 2-1. Roberto Quiroz gave the Trojans a 3-1 lead with a victory at line 3, but again the Bears closed the gap, with Michael Dornbusch, making his ITA debut, getting a win at line 4. Baylor's Patrick Pradella won a second set tiebreaker from Raymond Sarmiento at 1 to keep the Bears in it, and for several games, there was nothing to dampen Baylor spirits, but Michael Grant went up 5-3 at line 6 and closed it out, beating Vince Schneider 5-6, 6-2, 6-3. UCLA dropped the doubles point to No. 7 Oklahoma, but top-ranked Clay Thompson erased that deficit quickly, taking a surprisingly lopsided 6-2, 6-0 decision from second-ranked Guillermo Alcorta at line 1. Two Bruin freshmen, Joe DiGiulio at 6 and Mackenzie McDonald at 3, gave UCLA a 3-1 lead with straight-set wins, but the fourth point was a long time coming. Sooner Axel Alvarez took the second set from Marcos Giron at line 2, and Dane Webb posted the second point for Oklahoma with a win over Gage Brymer at line 4, but Dennis Mkrtchian tallied a . 6-2, 5-6 (6), 6-3 win over Alex Ghilea to clinch the win and set up yet another meeting of the Pac-12 rivals. The Virginia match with Ohio State is scheduled to begin at noon Central, with the USC - UCLA match to follow around 3. For results from today quarterfinals see below, for the results of the consolation matches, see this page at the ITA website. 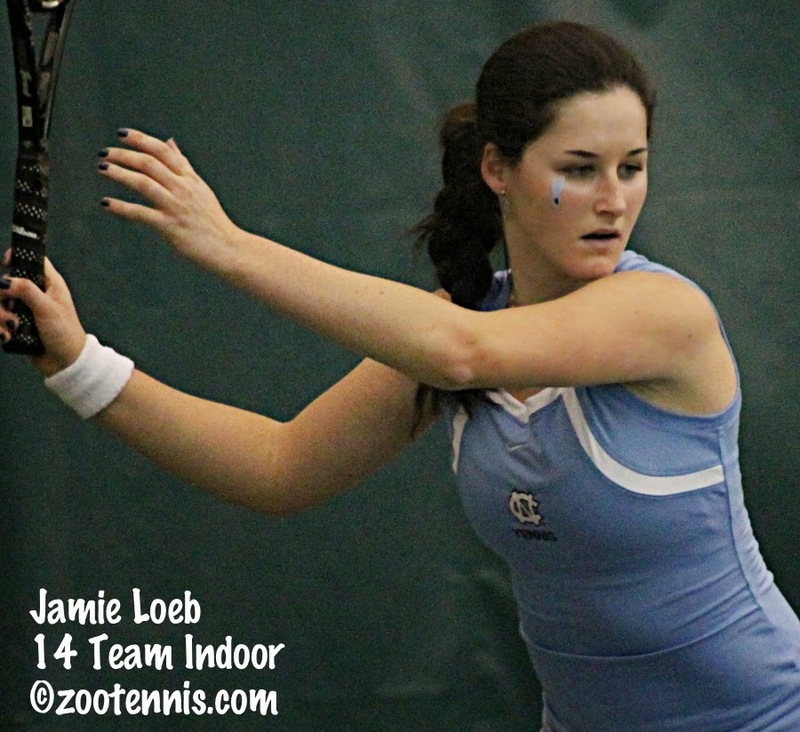 CollegeTennisOnline is also providing coverage and predictions, which can be found here. My recap of Duke's title at the Women's Team Indoor was published today on the Tennis Recruiting Network, and the ITA announced the All-Tournament team today, with Duke's Hanna Mar named Most Outstanding Player. Below is a slideshow of the All-Tournament team. The Men's Team Indoor got underway today in Houston, with fully half of the matches coming down to the last match on court. No. 13 Texas defeated No. 4 Georgia in the only upset of the day, and it ended when Ben Wagland was overruled on his own match point, which was the deciding point in the no-ad format they are using in the men's tournament this year. Because he was overruled three times previously, this was a game penalty, and because that game was the tiebreaker at 5-all, another format change for this tournament, he lost the match to George Goldhoff , giving Texas a 4-3 win. In addition to the match, Wagland apparently lost his composure too, having words with the umpire. He was suspended by coach Manny Diaz for the remainder of the tournament. I know all this, not because I was there, which I am not, but because it is in the recap on the Georgia website. I continue to be impressed by the commitment and professionalism (in the best sense of the word) of the sports information staff at Georgia, who reported what happened and provided a quote from Diaz on the suspension. Many a school's athletic department could learn from Georgia's handling of an incident like this. An earlier 4-3 match saw No. 7 seed Oklahoma defeat No. 10 seed Illinois 4-3, with Sooner Guillermo Alcorta beating Jared Hiltzik 6-3, 5-6(2), 6-4 at line 1 to tie it at 3-3, and Dane Webb topping Brian Page 5-6(7), 6-4, 6-2 at line 4 to clinch it. The evening matches were both decided by 4-3 scores, with Baylor's Mate Zsiga clinching a win for the Bears at line 4 over host Texas A&M's Junior Ore. The other Bears, from Cal, won when Gregory Bayane defeated Rishhab Agarwal of Mississippi State at line 5 to secure the 4-3 win. The Duke men's tennis team was unable to travel to Houston to compete in the ITA Men's Team Indoor, which gets underway on Friday. 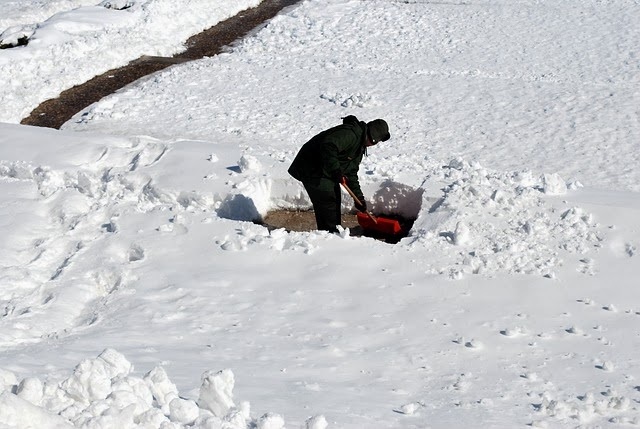 Having just driven through Durham earlier today, where we stopped counting the abandoned cars on I-40 when we got to 50, it's no surprise to me that the Blue Devils were unable to get a flight out the state, which is pretty much blanketed in snow throughout its length and breadth. It is a shame however, with so much great competition coming in the next four days, that they will not be a part of it. The tournament gets underway Friday at 9 a.m. Central with Florida(12) vs. Ohio State(5) and Illinois(10) vs. Oklahoma(7). Draws and links to live scoring can be found at the ITA's tournament page. A few days ago I retweeted a link to Parenting Aces, where Lisa Stone has posted information on the cutoffs for the Closed Regional tournaments this weekend. It's not a pretty picture, and I know Lisa is trying to get more information from Lew Brewer and Andrea Norman on the disparities. Lisa's post has generated over 100 comments so far, so it's worth your time to read the post and comments for perspective on the change and its implications for the summer's upcoming gold ball events. A short post today, with intermittent power outages and no internet at the hotel due to an ice storm, but I wanted to note the new rankings this week and the Men’s ITA Team Indoor draw. The top-ranked men’s doubles team is Tennessee’s Mikelis Libietis and Hunter Reese, with Georgia Tech’s Kendal Woodard and Megan Kurey taking over the No. 1 ranking on the women’s side. For complete rankings, see the ITA rankings page. See the ITA tournament page for the draw times and preview. 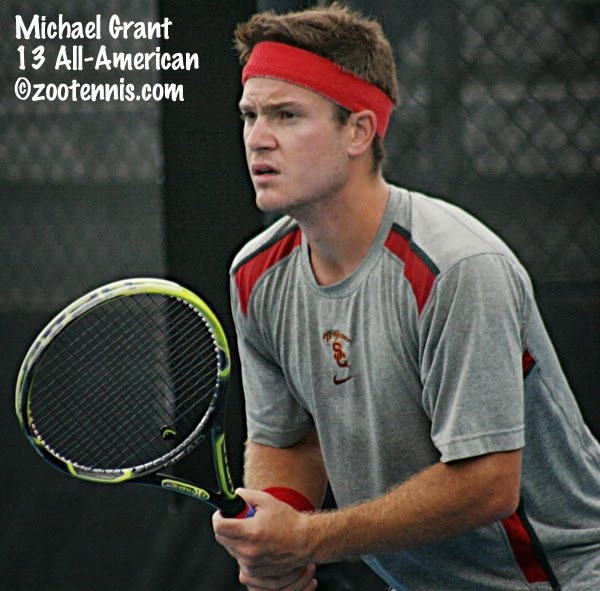 While I was immersed in the ITA Women's Team Indoor Championships, three former NCAA champions put up some impressive results last weekend at two ATP Challengers. 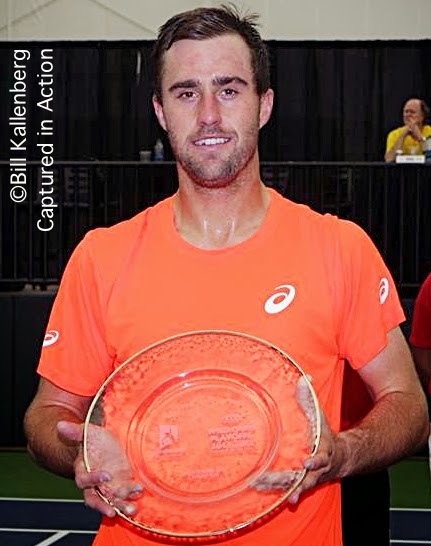 2010 NCAA champion Bradley Klahn(Stanford) won his second consecutive $50,000 ATP Challenger title, returning to Australia from his victory in Maui last month (not a short hop flight) to play the Adelaide Challenger as the top seed. The 23-year-old left-hander defeated No. 3 seed Tatsuma Ito of Japan 6-3, 7-6(9) in the final, and now has risen to an ATP career-high of 67. He is now the third-ranked American, after No. 13 John Isner and No. 56 Sam Querrey. University of Virginia graduate Jarmere Jenkins, who won the 2013 NCAA doubles title with current Cavalier Mac Styslinger, captured the doubles title in Adelaide. Jenkins and partner Marcus Daniell of New Zealand, who were unseeded, beat No. 3 seeds Dane Propoggia of Australia and Rubin Statham of New Zealand 6-4, 6-4 in the final. A PDF of the draws is here. Steve Johnson, who won the NCAA singles title in 2011 and 2012 while at USC, won his first Challenger since last summer in Nottingham at the $100,000 tournament. Unseeded, Johnson picked up a second round win over No. 6 seed Ryan Harrison, then took advantage of the early exit of all the other seeds, beating unseeded Malek Jaziri of Tunisia 6-4, 6-4 in the final. 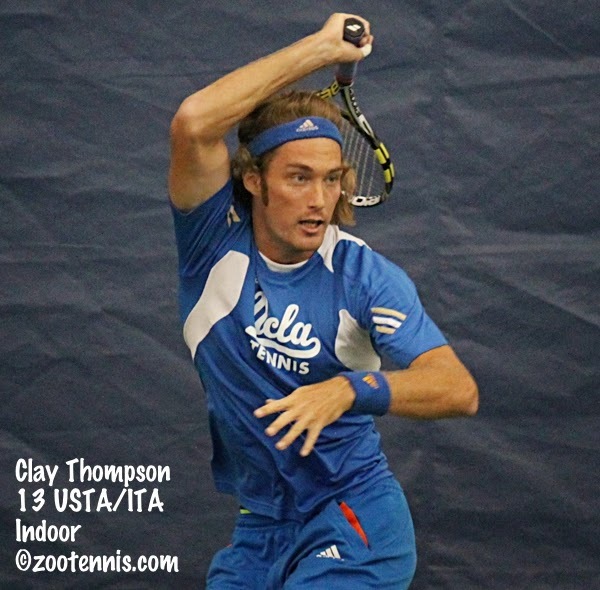 The only set Johnson lost was to UCLA senior (and fellow ITA Indoor champion) Clay Thompson, who received a wild card and pushed Johnson in the first round before falling 6-1, 5-7, 6-4. Johnson's ATP ranking rose to 129 with the win. Top seeds Sam Groth and Chris Guccione of Australia won the doubles title, beating unseeded (and mostly retired) Mark Knowles of the Bahamas and Harrison 6-4, 6-2 in the final. Germany's Tim Puetz, a former All-American at Auburn, reached the semifinals in Dallas. Complete draws can be found here. This week the only Pro Circuit event for the men is a $10,000 Futures in Sunrise, Florida, with qualifying concluding today. The women's Pro Circuit events are the $100,000 Challenger in Midland, Michigan and a $25,000 tournament in Rancho Santa Fe, California. Live streaming is available for the Midland tournament at usta.com. Teenagers Brooke Austin, Taylor Townsend and Tornado Alicia Black received wild cards into the main draw, as did defending champion Lauren Davis, who is the No. 2 seed, behind Poland's Urszula Radwanska, in her first tournament back after an extended injury layoff. Sachia Vickery, Vicky Duval and Allie Kiick are other young US players in the main draw. 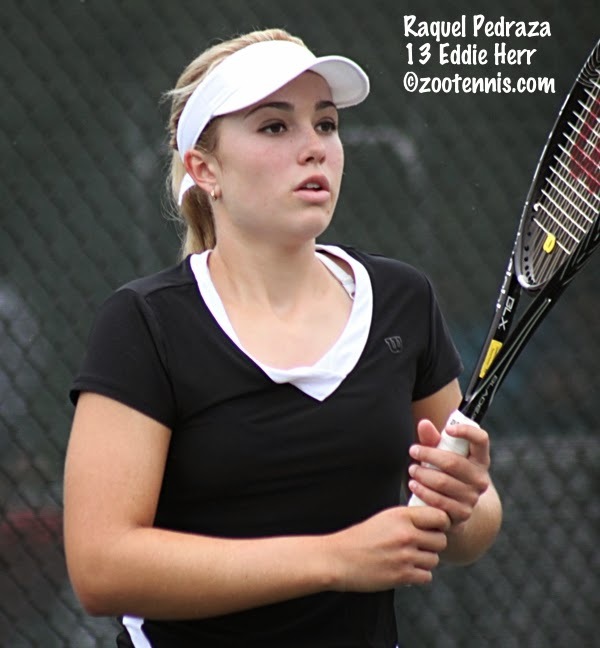 At the ITF Grade 2 last week in Peru, 16-year-old Raquel Pedraza, seeded No. 9, made her first ITF final, but lost to unseeded Julieta Estable of Argentina 6-4, 7-6(2). Mary Haffey of the US and Georgia Tech recruit Alexis Prokopuik of Canada, seeded fifth, won the doubles title, beating No. 7 seed Anna Brogan of Great Britain and Maghan Kelley of the US 6-2, 6-3 in the final. Logan Smith of the US lost in the boys doubles final, playing with Felipe Cunha Silva of Portugal. The third seeds lost to No. 5 seeds Marcelo Barrios Vera of Chile and Juan Jose Rosas of Peru 2-6, 6-3, 10-8. Peru's Nicolas Alvarez won the boys singles title, with the top seed beating No. 4 seed Pedro Iamachkine, also of Peru, 6-3, 6-1. This week there is an ITF Grade 1 in Morocco, with just one American entered, Miranda Ramirez. At the ITF Grade 2 in Bolivia this week, Jakub Wojcik and Kalman Boyd, the No. 11 seed, are the US boys in the draw. There are ten US girls in the 48-player draw, including No. 2 seed Nicole Frenkel, Pedraza(4), Ellyse Hamlin(5) and Ally Miller-Krasilnikov(11).